K'JIPUKTUK (HALIFAX) –Dalhousie University president Richard Florizone spent Earth Day sharing the accomplishments of his Advisory Council on Sustainability and planting four trees on the Dal campus. In the past five years, Dalhousie University has made significant strides on the forefront of sustainability, having first put its foot in that realm over two decades ago. Canada’s first Earth Day was held in 1990, and a year later Dalhousie started taking a leadership role in the sustainability movement. It hosted presidents and senior representatives from 33 universities in 10 countries, which began a discussion on how universities could begin to engage in the important topic of sustainability. 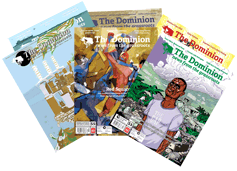 The 2007-2008 academic year was pivotal for environmental progress on campus. Dalhousie opened its Office of Sustainability, launched the academic College of Sustainability, and opened DSU’s Sustainability Office. Though each group has its own mandate and projects, the Advisory Council on Sustainability creates a place where they can all come together, says Florizone. In the past five years, Dal has invested more than $40 million in sustainability projects and operations across the campus, says Florizone. This spring a total of 150 students will have graduated from Dalhousie’s environment, sustainability and society program, which has created an entirely new generation of sustainability leaders, says Florizone. However, Divest Dal, a group of students, alumni and community members committed to divesting Dalhousie from fossil fuels industries, still believes that Dal can do more in order to keep in the lead of sustainable universities. 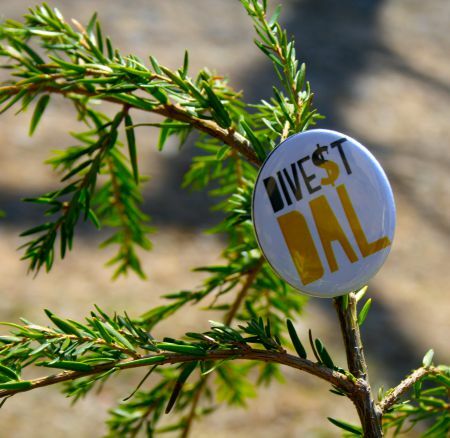 Divest Dal has taken part in Dal’s 100 days of listening, brought the president and his colleagues a 200 page proposal on how to divest, met with members of the board and the investment committee, and attended every Board of Governors meeting this year. 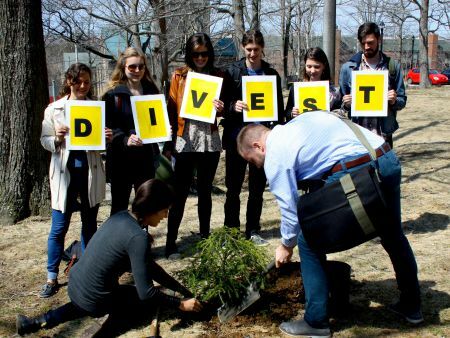 In order to continue to put pressure on the Board of Governors’ investment committee and President Florizone, Divest supporters showed up to Dal’s Earth Day ceremonies to hand out information about divestment and help plant a tree. James Hutt, a supporter of Divest Dal, approached Florizone after he finished planting his tree with a divestment proposal to hand to the president. Florizone responded by saying once again that he needs the investment committee to do the work and that they’ll get back to them once that has occurred.